In particular, he seems to object to the public seeing the actual data. Apparently that is a “misleading interpretation” of the facts. I’ve no doubt he would much prefer the blatant spin, which his chums at the Met Office like to use. Britain enjoyed its seventh hottest and second sunniest year on record in 2018, new figures show. The Met Office released its full round-up of weather statistics for the last 12 months on Friday, and the figures may come as a surprise considering much of the country was blanketed in snow and ice in the early part of the year. February and March saw freezing average temperatures of 2.4C (36.3F) and 3.8C (38.8F) because of the arrival of the Beast from the East, but 2018 still ended up making the top ten hottest years ever. The UK average across the whole year was 9.49C (49F) thanks to an extraordinarily hot summer and milder than usual temperatures during the autumn. July was the hottest month, clocking in at an average of 17.3C (63.1F), and the amount of sunshine we enjoyed came within hours of topping what we were treated to in 2003. That year recorded 1,587 hours of sunshine, compared to 1,581 in 2018. 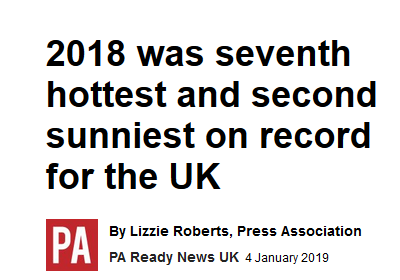 Dr Mark McCarthy, head of the Met Office National Climate Information Centre, said the heat and sunshine statistics were consistent with a general trend of our climate warming up. Last year was the seventh hottest and second sunniest on record in the UK, new figures show. 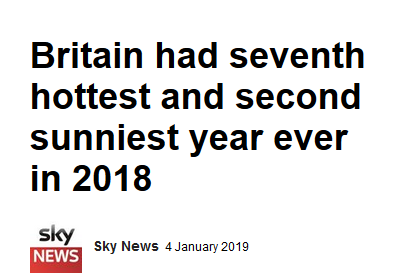 This means the ten hottest years all fall in the 21st Century, highlighting a general trend in the UK’s climate warming, the Met Office said. 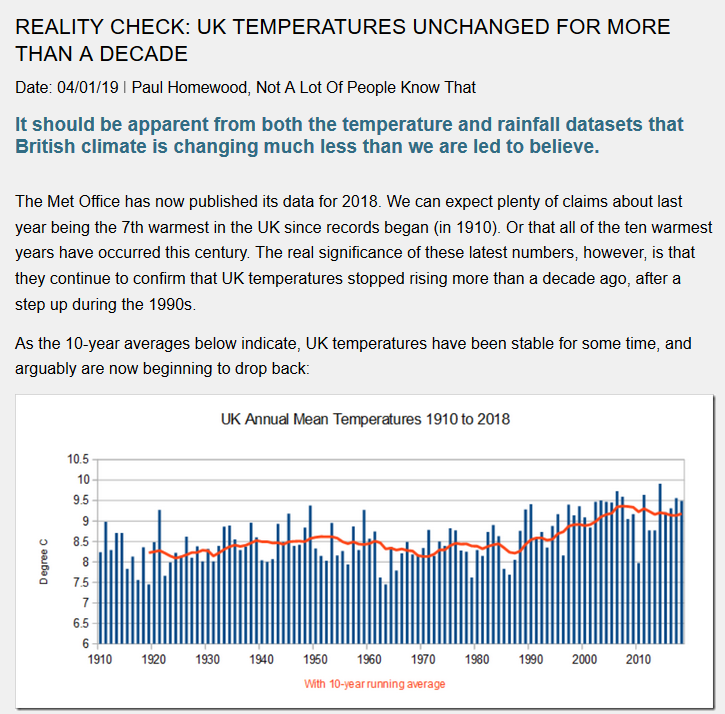 Dr Mark McCarthy, head of the Met Office National Climate Information Centre, said: “2018 adds to our picture of the warming climate in the UK. Nowhere do the Met Office admit that temperatures have plateaued since the turn of the century. And nowhere do they even offer a graph, so as to let people decide for themselves. Instead, McCarthy continues to peddle the false impression that the UK’s climate is “still getting warmer”. This is grossly misleading. It is obvious from the Met Office’s own data that there has been no warming this century. 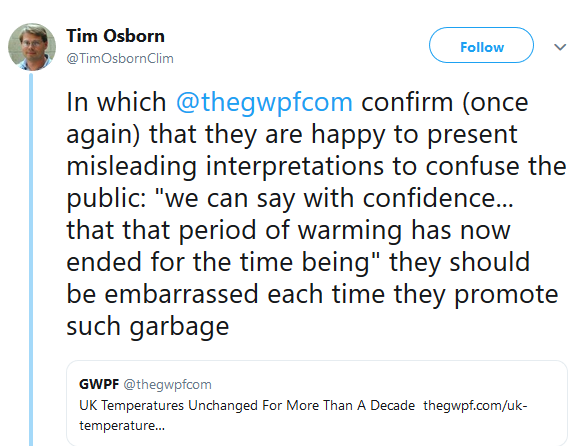 For some reason, Osborn has no objection to the Met Office attributing the short spell of warming in the 1990s to a general trend in the UK’s climate warming. He also thinks we should not be paying attention to UK temperatures, but to global ones instead. But the whole point of the post was to look at the UK scene. Don’t people have the right to see facts? Or must they only be allowed to read the Met Office’s highly biased interpretation?